Biological responses to climate change are typically communicated in generalized terms such as poleward and altitudinal range shifts, but adaptation efforts relevant to management decisions often require forecasts that incorporate the interaction of multiple climatic and nonclimatic stressors at far smaller spatiotemporal scales. We argue that the desire for generalizations has, ironically, contributed to the frequent conflation of weather with climate, even within the scientific community. As a result, current predictions of ecological responses to climate change, and the design of experiments to understand underlying mechanisms, are too often based on broad-scale trends and averages that at a proximate level may have very little to do with the vulnerability of organisms and ecosystems. The creation of biologically relevant metrics of environmental change that incorporate the physical mechanisms by which climate trains patterns of weather, coupled with knowledge of how organisms and ecosystems respond to these changes, can offer insight into which aspects of climate change may be most important to monitor and predict. This approach also has the potential to enhance our ability to communicate impacts of climate change to nonscientists and especially to stakeholders attempting to enact climate change adaptation policies. -P.K. Den Boer (1968) Spreading the risk of stabilization of animal numbers. Acta Biotheoretica 18:165–194. Understanding and predicting the impacts of global climate change on natural, managed, and coupled socio-ecological systems is one of the most pressing challenges facing science today. The task is not an easy one. Spatial and temporal variation in the distribution of climatic and nonclimatic stressors often result in nonlinear (and therefore highly complex) patterns . Direct attribution of observed changes to anthropogenic climate change is also challenging , by and large due to the fact that climate change seldom acts in isolation when impacting organisms and ecosystems ,. Nevertheless, the scientific literature is replete with studies that demonstrate the very real effects of changing climatic conditions on species’ distributions, phenology, and patterns of growth, productivity, and reproduction -. Much of the progress to date made in evaluating the ongoing impacts of climate change has been accomplished by stepping back and evaluating general patterns. Methods such as meta-analysis have served as useful tools for demonstrating broad-scale trends in how ecosystems are responding to environmental change and as a framework for estimating the magnitude of future impacts. As a result of these analyses, it is now generally accepted that climate change is driving poleward and altitudinal range shifts in species distributions as environmental conditions at the equatorial or lower altitudinal edges of a species’ range exceed their physiological tolerances and conditions at poleward or upper altitudinal limits become tolerable ,. Similar generalities are being used to inform empirical work; Intergovernmental Panel on Climate Change (IPCC) predictions such as expected increases in average sea surface temperatures (e.g., 2°C–4°C) and future p CO2 levels (e.g., 1,000 ppm) have provided guidance for comparative biological experiments, contrasting species responses under current and future environmental conditions . Much has been learned from such approaches. But to what extent has our quest to seek generality, perhaps driven at least in part by the perceived need to communicate complex scenarios in a simplified manner, potentially clouded our interpretation and expectations of what we observe and influenced how we conduct experiments to quantify those effects? Here, we argue that while generalizations and overall trends are useful heuristically, they frequently fail to match the scale of ecological responses that are driven by spatial and temporal variability in both climate-related stressors and the nonclimatic factors with which they interact. While such a statement may seem axiomatic or even “common sense”, it is often strikingly at odds with the way that experiments are designed and with how we communicate climate change impacts to nonscientists, especially to stakeholders attempting to proactively manage natural systems experiencing ongoing impacts. For example, climatic trends (30+ year trends in average surface temperature and carbon dioxide concentrations) are increasingly being used to project organismal physiology and species’ range limits . It is clear, however, that decadal-scale increases in mean temperature (i.e., climate) are not the proximate drivers of performance and survival at organismal scales and thus ultimately are not the cause of observed changes. Instead, organismal vulnerability, including mortality, growth, and reproduction—the underlying drivers of ecosystem function and species distributions—are affected by shorter-term variation in environmental conditions (i.e., weather), including extreme events , that are implicit in climatic predictions. In many cases, because of the high temporal and spatial heterogeneity in climatic factors such as air and water temperature, many locations are already experiencing weather anomalies that far exceed the increases in mean temperature projected far into the future. For example, in the Gulf of Maine, summer sea temperatures in 2012 were 1°C–3°C above the climatology for the previous three decades, akin to temperatures forecast for 2100 . Thus, using physical data and model outputs that reduce environmental change to simplified trends such as annual or decadal means, or making assumptions such as poleward and altitudinal range shifts, is likely to be misleading when designing or implementing climate adaptation strategies. Ironically, such reliance on generalized average changes may have impeded our ability to communicate climate change impacts to nonscientists, since deviations from these predicted standards may be misinterpreted as counter-evidence to “global warming.” Even scientists are seduced by such generalizations, with increasing numbers of physiological and ecological studies using global climatic means to inform experimental design. To avoid these potential misinterpretations, we argue that our expectations of how climate will likely impact commercially and ecologically important species should, whenever possible, be based on physiologically and ecologically relevant metrics over appropriate spatial and temporal scales -. Such predictions should emphasize how altered weather patterns interact with nonclimatic stressors to drive local-scale processes  and acknowledge the often overriding importance of biology—including physiological acclimatization and adaptation to local environments—in determining patterns of vulnerability and response over multiple spatial and temporal scales. Specifically, we explore how a focus on explicit mechanisms by which environmental change affects biological systems can provide insight into what we truly should expect to observe in nature and offers a valuable tool for understanding which aspects of climate change are most important to monitor and predict. We explore these concepts through three lenses: (a) the design of experimental protocols to understand the mechanisms by which climate change affects organisms and ecosystems, (b) the development of climate adaptation strategies, and (c) the potential effects of rhetoric on the effective communication of the impacts of climate change to nonscientific audiences. Global climate change is now the backdrop against which all biological, ecological, and socio-ecological interactions occur. There is thus enormous interest in predicting “winners” and “losers” among commercially, ecologically, and culturally important species ,, and the subsequent impacts on patterns of biodiversity . A key and often overlooked consideration is that organisms (including humans) are not directly affected by climate, per se, but rather more proximately are affected by weather, which ultimately is trained by climate (but see -). Similar discussions of the application of climatic indices such as the El Niño Southern Oscillation (ENSO) provide some insight as to why this is the case . Hallett et al. , for example, showed that, superficially, the North Atlantic Oscillation (NAO) displayed better correlations with variation in the population dynamics of Soay sheep than did local weather patterns. However, when details regarding the roles of factors such as competition for food and the history of extreme events were included in a process-based approach, weather emerged as a stronger predictor of the sheep’s population patterns. Like NAO and ENSO, “climate” is a useful indicator of broad-scale changes in patterns that impact organisms and ecosystems. However, the mechanisms that actually affect biological processes are inherently implicit and may significantly covary with one another . For example, average seasonal temperatures may be correlated with rare extremes that actually cause damage, but these correlations may not always hold. Several recent discussions have explored the issue of “no analog” communities and have emphasized that correlative niche models based on existing patterns may fail to accurately capture limits under future, novel climatic conditions ,. An explicit focus on the weather patterns likely to occur under future climate scenarios  coupled with knowledge of which factors most affect organisms  will provide insights into this dilemma. For example, many studies have shown the importance of chronic, sublethal exposures that may cumulatively lead to mortality or reproductive failure, for example, due to energetic limitation ,. The time history of exposure can be also critical in determining the degree to which organisms are able to acclimatize to environmental variations ,, and over longer time scales to how populations can potentially adapt . For example, the rate of temperature change imposed on animals during physiological experiments can significantly alter the biological responses observed . The importance of rare, but extreme, events on species’ range distributions can also be overlooked. For example, mortality of intertidal species from an exceptionally cold winter in 1962–1963 in Europe caused major southward shifts in many species’ northern range boundaries. Because some species have not fully recovered their former ranges , contemporary weather conditions may be decoupled from present-day range edges, and weather conditions over the last 50 years may thus offer little or no information on the determinants of current range boundaries. Ontogenetic changes can also impact our predictions, as sensitivity to environmental change can vary between different life history stages so that populations can be particularly sensitive to conditions that occur for only a portion or particular life history stage of an organism’s lifetime ,. Considering the roles of acclimation and local adaptation in predictions of climate change impacts is becoming increasingly recognized and has emphasized how limiting factors such as critical thermal maxima can vary throughout a species’ range. For example, it is now widely recognized that bleaching in corals occurs as a function of ‘degree-weeks’ over a threshold that is set by local climatic conditions  rather than by some fixed temperature. In contrast, many polar species show poor ability to acclimate to warming temperatures , and some species with relatively high rates of larval dispersal (and thus high rates of genetic exchange) likewise show apparently little geographic variation in thermal tolerance . Increasing emphasis is also being placed on the potential role of local adaptation as a result of natural selection, where populations become composed of more tolerant individuals . Yet, while evidence of local adaptation has been shown to occur in some species , where such adaptation has not occurred, “fringe” populations with low levels of genetic variance have been shown to be particularly susceptible to environmental change . Assessing the impacts of environmental change can further be complicated by extremely high rates of temporal and spatial heterogeneity in factors such as temperature. 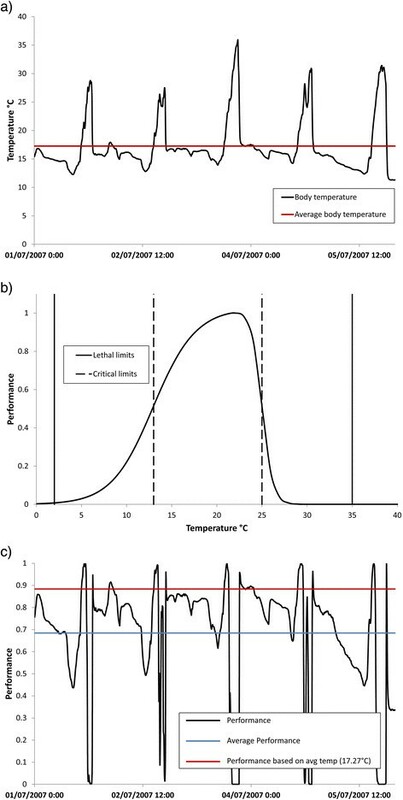 Most organisms on Earth are ectothermic; their body temperatures change with varying ambient conditions and thus so does their physiological performance when rates of change exceed their ability to acclimatize (Figure 1). Thus, in any environment with appreciable variation, organisms spend very little time exposed to “average” conditions. Given nonlinearities in thermal responses, the physiological response of an animal exposed to fluctuations in body temperature between 10°C and 35°C, for example, cannot be predicted using constant conditions of 17.5°C (Figure 1). This disparity is akin to other mathematical formalizations such as Jensen’s Inequality  and is often overlooked when working with natural systems, which are inherently variable and nonlinear . Translation of environmental variation into physiological performance. (a) Example of a time series of body temperatures measured in a rocky intertidal mussel. When multiplied by a (b) thermal performance curve, (c) performance over time can be estimated. Almost all physiological processes are affected by temperature, and organismal impacts ultimately drive ecological and biogeographic responses. Most organisms are ectothermic (i.e., retain no appreciable metabolic heat) and many have body temperatures that fluctuate with environmental conditions; in some environments, daily ranges of 20°C or more are not uncommon. The relationship between body temperature and ecophysiological metrics or traits such as growth and ability to forage can be described by a thermal performance curve, which is often left-skewed. Such curves (b) can describe not only thermal optima and lethal limits (solid lines) but also sublethal limits (dashed lines) that can be exceeded for short periods but after chronic exposure can lead to mortality. Because the relationship between body temperature (which can differ from environmental temperature) and performance is nonlinear, average performance (blue line in c) cannot be calculated from average temperatures (red lines in a and c) in any eurythermal environment. Notably, by smoothing input data, not only are the potentially lethal effects of extreme temperature neglected but also incorrect estimates of growth and reproduction or the cumulative effects of stress on mortality can ensue. Perhaps most importantly, stressors most closely related to climate change such as temperature, rainfall, and ocean acidification frequently interact with one another and with other nonclimatic factors such as food availability (which can enhance resilience to thermal stress), access to refugia (which can reduce thermal stress), and pollution . For example, where increased metabolic demands can be met by ample food supply, populations often do not demonstrate otherwise predicted negative responses to stressors such as ocean acidification and extreme temperatures . In contrast, exposure to stressors such as ocean acidification can increase susceptibility to mortality at lower temperatures than predicted by thermal performance curves alone . Similarly, populations that are already depressed due to overharvesting are more likely to be affected by environmental change in part because they have reduced reproductive output and therefore limited capacity for genetic and/or phenotypic variation . In some cases, the most biologically relevant aspect of weather is the temporal coincidence of stressors, such as rainfall and extreme temperatures ,. Furthermore, environmental change can affect species interaction strengths ,, so that differential impacts on predators and prey can lead to counterintuitive responses of species in ecosystems . The complex relationship between ecological patterns and the frequency, magnitude, and time history of variation in multiple environmental factors thus poses a considerable challenge to niche models used to predict future ecological responses ,. The current literature abounds with discussions about process-based vs. statistical ecological forecasting approaches , and confidence in our ability to predict species responses under future conditions . At issue is the underlying assumption of space for time substitution, i.e., that models constructed from contemporary observations can effectively predict responses under future, often novel, environments  and that environmental variability remains constant, regardless of the time over which it is measured . A recent example of model failure in space is instructive as to why space for time substitution cannot always be assumed. Jones et al. constructed a process-based niche model based on exposure to lethal temperatures that accurately predicted the distribution of intertidal mussels on the East coast of North America. When the model was applied to the same species on the Atlantic coast of Europe, however, it failed to predict observed distributions. Instead, it was shown  that range limits on this coast are likely set not by lethal exposures, but rather by energetic limitations resulting from chronic exposure to sublethal conditions (Figure 1b). Thus, while rare extremes are important , so are other drivers, especially when climatic factors interact with one another  and with nonclimatic stressors . Hence, changes through time in one location are not always observed in another. Similarly, niche models developed based on current observations may not be effective under future, novel conditions if they are not fully described by current climates and if they fail to account for all components of a species niche space . In other words, we run the risk of fitting data that extend beyond the limits of the datasets from which they were constructed, unless we incorporate information describing the impacts of novel climatic conditions on organisms. Such information may be derived from controlled experiments, such as those described above; however, caution should be exercised so as not to over-extrapolate from such controlled approaches. Progress is definitely being made in considering these issues, such as the incorporation of “weather” into “climate” predictions  using techniques such as stochastic weather generators  to account for predicted variability in environmental conditions , and particularly the inclusion of return time of extreme events ,. Further, some species distribution models have included physiological traits ,. Nevertheless, a host of physiological and ecological studies continue to compare levels of growth, survival, and reproduction of organisms under contemporary conditions against experimental treatments designed to represent “future” scenarios (e.g., present day +2°C), using climatic means -. These studies are useful in the same way as systematic surveys, in that they provide yardsticks to gauge the sensitivity of organisms to changes in their environment. Their potential applicability to observable patterns in nature, however, is difficult to assess (Figure 1). In some cases, experiments have incorporated estimates of variability in physical drivers , but most are based on contemporary and projected means, in some cases seasonal or monthly, but often annual values . A corollary of this argument is that the physical models used to project future ecological responses at spatial and temporal scales relevant to management decisions need to effectively capture biologically relevant parameters ,. Specifically, climate models should not be applied in a context that is divorced from how they were originally evaluated, and vice versa. While we often focus on central tendencies, for example, by “smoothing” data, it may often be the case that what is considered as “noise” may in fact be the most important driver of biological responses . Thus, annual mean air or sea surface temperatures are useful in ecological forecasts or hindcasts only to the extent that these variables reflect underlying drivers of ecological responses, in precisely the same way that a climatic index such as NAO or ENSO is indicative of underlying weather that is the proximate driver of biological response . For example, physical models tuned to maximize skill (i.e., normalized model error variance such as root mean square error , Figure 2) using central tendencies (i.e., average conditions) are less useful when applied to biological questions than those that have high skill in predicting the frequency and return time of extreme events when the latter metrics are most important for ecological responses ,. While a recent emphasis on the importance of the velocity of change in setting distributions  is potentially one step closer to mechanism, it too is likely only an indirect indicator of the processes that actually affect organisms . Tests of model skill using different metrics. (a) Tests of model skill compare predicted (modeled) variables against field observations, and common metrics are goodness of fit (R2) and root-mean-square error (RMSE). “Messy” (high frequency) data (a) are often smoothed using averages (b) which are then used to assess model skill. In this example, two metrics of skill are presented, one based on monthly averages (b) and one using monthly maxima (c). The two tests give widely divergent estimates of model performance, as indicated by the test statistics, but actual model skill will depend on which of these metrics (average or extreme) most accurately represents the driver affecting the organisms being modeled. 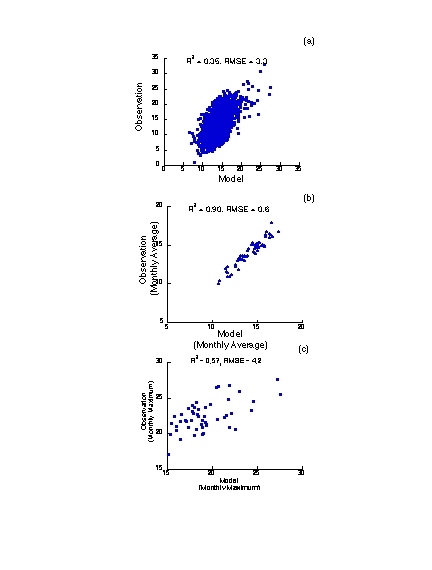 In order to have confidence in a model’s ability to predict biological response, it must be tested against metrics that have been shown to be biologically meaningful and not simply covariates of those that are. In many cases, commonly used parameters such as annual means may have little biological relevance, as the degree to which they are correlated with biologically meaningful values may not apply under future, novel climatic conditions. The importance of considering relevant scales of environmental variability, and of the influence of multiple stressors, is not novel and has been addressed by previous authors. Yet—and this is among our major points—it is seemingly at odds with the way that many “climate change experiments” are conducted . It is tempting to dismiss these issues as merely differences in “resolution” or the scale of the question being addressed, for example, those asked by a biographer as compared to those explored by a physiologist. However, a focus on underlying drivers (i.e., weather) can potentially yield substantially different predictions than ones based on large-scale averages, even over broad geographic and temporal scales. The inclusion of weather in the climate models applied to ecological experiments may be crucial for several reasons . Most climate scenarios forecast an increase in variability, so that the chance of exceeding thresholds such as critical thermal maxima or minima is likely to increase. Although organisms may have the metabolic plasticity to acclimate to small changes in temperature, one extreme event, even lasting one or several days, can cause significant mortality within populations . An increasing number of studies compare lethal tolerances of organisms against projected extremes in temperatures . To be effective, however, models incorporating lethal effects must use inputs from physical climate models that are specifically designed to accurately capture those extreme events (c.f. mean temperatures). Our point here is not that we should attempt to account for every possible combination of environmental conditions when forecasting ecological responses to climate change. There will never be enough resources to assess all potentially relevant combinations of environmental conditions, for all species, nor would such a compendium necessarily be useful given uncertainty in future weather. Rather, our central argument is that what comprises an appropriate test of model skill, for example models of temperature, rainfall and ocean pH, to a large extent will depend on the application to which the model is applied (Figure 2). Given the large time scales involved in climate modeling, our argument primarily applies to how such models are validated today using nowcasting and hindcasting methods but have direct relevance for our confidence in space for time substitution approaches that are the hallmark of ecological forecasts. Particularly, when outputs from physical models are applied to biological questions, or when ecological models are applied to predict socioeconomic impacts, an understanding of the assumptions and validations of the model are critical, yet rarely are these communicated. Such considerations may be especially important when coupled physical-ecological model predictions are used in climate adaptation strategies. It is now widely acknowledged that the impacts of past and present greenhouse gas emissions on the global climate will persist well into the future due to earth-atmosphere feedbacks and inertia in the climate system . While mitigation to reduce greenhouse gas emissions in an attempt to achieve climate neutrality and to reduce future climate impacts is still a high priority, both reactive and proactive adaptation strategies need to be implemented to reduce the adverse impacts of impending climate change. A combined mitigation-adaptation management approach requires decision-making within a framework of considerable uncertainty with respect to future climatic states. Climate projections and forecasts of the response of natural systems to future climate change are thus frequently used to inform management plans. The goals of climate management strategies are to enhance resilience of natural and human-managed populations to environmental stress and to enhance ecosystem services provided by intact communities, including in some cases rehabilitation of damaged ecosystems . Successful implementation of such strategies can, however, be hampered by a narrow focus on broad-scale generalizations such as those described above . For example, as explored in the previous section, predicted vulnerability of key species and ecosystems is often based on annual mean conditions ,, despite the fact that such simplified predictive frameworks may not capture the interactive nature of multiple stressors, or the overriding impacts of short-term weather and nonclimatic stressors ,. A useful analogy to these assumptions is research on the efficacy of pharmaceuticals. In this field, broad-scale trends in the effectiveness of various treatment options are often demonstrated using meta-analysis of clinical trials. The purpose of these studies, like those exploring climate change impacts, is to tease apart the relative effects of a particular treatment regimen from the many other potentially confounding factors such as age, nutritional status, and other health issues. In the case of pharmaceuticals, the goal is to demonstrate an effect of the treatment; in climate research, it is to detect a fingerprint of climate change impacts. In both cases, these approaches are valuable in detecting whether such relationships exist. However, as emphasized by recent reviews in the medical literature , the results of such meta-analyses need to be interpreted with extreme caution when treating actual patients, as individual variability and health history can lead to outcomes that are contrary to trends in the general population. The take-home message from this is that actual patient care is (or at least should be) highly individualized, and patient treatment should not be based on the results of meta-analysis alone without also considering the patient’s history, risk factors, and other medications being prescribed. The application of meta-analysis and other systematic syntheses and reviews to explore climate change impacts is similar in that trends in “clinical trials” (field observations) are considered in aggregate to detect the influence of the overall “climate signal” from other drivers. In contrast to pharmaceutical studies, seldom is variability in space and time built into our discussions of climate impacts, at least at scales smaller than the regional level (but see ,). While this broad-brush approach was initially appropriate because of a lack of high-resolution data, the present-day availability of environmental records has dramatically improved the temporal and spatial resolution of data which can be incorporated into modern analyses ,. Therefore, while it may still be appropriate to use meta-analysis to identify broad trends in some situations, we are now able to incorporate “patient-specific” information into climate adaptation strategies at regional or potentially even local scales using downscaled model predictions , coupled with high-resolution environmental data  and measures of nonclimatic stressors (e.g., eutrophication). In other words, we can now focus on communities and populations rather than species ,. While such an approach is likely not appropriate for all applications, it may be particularly relevant for examination of particular species of interest such as threatened and/or endangered species , commercially important species ,, disease-causing organisms , and keystone or structuring species that have cascading effects on ecosystems . An example of the need for such an approach is evident in spatial planning for protected areas. The number of documented cases of poleward range shifts in marine ecosystems is increasing, and such analyses are often applied over continental scales and may cover both high- and low-latitude range boundaries. While potentially of use at the extreme range edges of a particular species, assumptions of a generalized poleward migration are less useful when exploring populations further from a species’ distributional limits or when range edges of interacting species do not occur at the same location. Recent models that incorporate population dynamics illustrate this point, demonstrating that within the majority of a species’ range, extreme temperatures may be less important than local-scale ecological factors and chronic stress in determining abundance . Subsequently, assumptions based on poleward range shifts do not provide sufficient information to accurately predict what will happen at spatial or temporal scales appropriate for management or adaptation strategies ,. For instance, habitat availability dramatically alters the ability of species to expand at their poleward range edge, especially if they have limited dispersal ability . The importance of local and regional drivers such as wave splash and the timing of the tides is known to create geographic mosaics in stress in intertidal ecosystems, so that physiological stress is not well correlated with latitude for some species ,,. Significant genetic structural differences can be created or at least influenced by local and regional conditions . For example, substrate type and discharge from the Yangtze River drive gene flow and contemporary phylogeographic distribution of rocky intertidal species in China. These findings suggest that climate change, land reclamation, and dam construction along the Yangtze River will dramatically affect the phylogenetic distribution of many species along the China coast . Similar heterogeneity has been shown in treeline ecosystems as a result of microtopography . The perception that abundances are highest, and levels of stress lowest, in the middle of species ranges may not, therefore, be a safe assumption . A more tailored type of assessment provides an opportunity to potentially ameliorate the impacts of climate change on the “patient” (here, population) by reducing stress from nonclimatic factors such as overharvesting and pollution ,. Just as planning for protected areas requires information of local conditions, information on other stressors such as pollution and commercial farming/harvesting also needs to be incorporated . Successful planning can be significantly augmented by an understanding of the mechanisms underlying such processes . For example, nutrient pollution in oligotrophic coastal waters can disproportionately increase the likelihood that a system will transition to a degraded state by altering competitive hierarchies, often at the expense of foundation species . Any efforts to increase the survival of organisms in such regions may thus lie in reducing nutrient loading . In contrast, increased nutrients may improve resilience of some commercially important species, such as filter feeding bivalves, as increased food supply can enhance thermal tolerance . Knowing which strategy to follow requires specific knowledge of environmental conditions relative to a species’ tolerances, in other words, a complete understanding of its fundamental niche space . Similarly, the effects of increasing temperature can have differential impacts depending on where organisms live relative to their thermal tolerances and optima. Thus, for habitats where organisms live at temperatures below their optima (Figure 1) (Additional file 1), small increases in temperature may initially stimulate growth and reproduction, whereas at sites where animals live at or above their optimum, increasing temperatures will have the opposite effect . In order to predict how a species’ performance will likely change in coming decades, it is important to understand what the tolerances of organisms are at the location of interest, especially in systems where stressors such as temperature do not correlate well with latitude  or altitude . Such information cannot be obtained without a mechanistic knowledge of how species of interest are affected by local environmental conditions ,. Humans, like other organisms, are affected by weather rather than by climate per se, but the conflation of weather and climate is manifest in public discourse. Considerable evidence from public opinion polls and cognitive studies suggests that people’s perception of climate change is shaped significantly through their experience of weather . Consistent with the concept of “shifting baselines”  the “norm” against which most people unconsciously compare observed climatic deviations derives from short-term, personal experience. Thus, nonscientists can erroneously view interannual variability, for example, a relatively cool year, as evidence against global climate change . Long-term trends in climate that are generally understood only through examination of data that span decades, centuries, and millennia are thus difficult to convey to the public, whose mental models may differ from those of scientists and others accustomed to assimilating data . Accordingly, controversy has emerged over whether or not direct attribution of extreme events to anthropogenic climate change is advisable  or even possible . Efforts to distinguish climate from weather can prove to be a double-edged sword. An opinion poll following disastrous weather events in 2012 in the U.S. suggested a dramatic shift in public perception of the risks of climate change . More recent polling suggests that the upswing in interest in climate change impacts may have been short lived, likely in part due to a colder-than-average winter in 2013 . Conversely, a study following the same period of severe cold weather in the UK showed that a large majority of British citizens surveyed saw such events as providing positive evidence for climate change due to people conceptualizing these extreme or ‘unnatural’ weather events as resulting from climate change . We postulate that these dividing lines may occur, at least in part, as a function of the way scientists discuss climate impacts, which is often in generalities . This is nicely illustrated by a study by Crimmins et al. who demonstrated that increasing temperatures coupled with increasing rainfall over a 75-year period led to an altitudinal downshift in the distributions of 64 species of plants. The way in which increased water availability can counteract increased temperatures, resulting in plants being able to live at lower altitudes, makes biological sense, yet the study was viewed by skeptics as a challenge to assumptions and predictions made by the IPCC . In part, this likely reflects a poor public understanding of how climate change operates and manifests, but also the creation of misconceptions as a result of how the expectations of climate change are portrayed to nonscientists. Working Group 2 of the 2007 IPCC report, for example, presented a table (Table 1.9) documenting “evidence of significant recent range shifts polewards and to higher elevations”, the strong implication being that such results were evidence of biogeographic shift in response to climate change. What goes unsaid in this instance is that such observed shifts are driven by sufficiently large changes in biologically meaningful environmental conditions. It is not difficult, therefore, to see how contrasting results such as those presented by Crimmins et al. may be misinterpreted as prima facie evidence against the importance of environmental change. Crimmins et al.’s findings  are in fact not evidence against climate change impacting species distributions; they simply represent the interaction of multiple environmental conditions and, again, highlight the need to incorporate species-specific, local conditions into our predictions. Interestingly, this study also elicited several heated responses in the pages of Science, most criticizing whether Crimmins et al.’s results could be generalized to other species and locations . Research from the psychological literature offers insight into the seeming disconnect between the scientific community and the general public. Goodwin and Dahlstrom  explored the levels of trust between climate scientists and their lay audiences, and suggested that trust was established, at least in part, when communicators make themselves vulnerable to their audiences by offering predictions that may in the end be proven wrong and by accepting the consequences of these incorrect predictions. On this premise, weather forecasters are highly trusted, not because they are flawless in their predictions, but because they make predictions on a daily basis that are then tested empirically by their lay audience. On average, weather forecasters’ predictions are within an acceptable level of error, and trust is established with faithful viewers . This provides a useful contrast with the current way that scientists typically communicate ongoing climate change impacts. For example, any post hoc explanations of the rationale behind the results of the aforementioned study by Crimmins et al. were likely viewed by skeptics as scientists “making excuses”. It can be argued that the expectation of upslope range shifts was the result of predictions based on generalizations, rather than on the specific conditions at the study sites. The direct analogy to this presentation of climate change impacts as a series of average trends would be a weather forecaster repeating the same forecast nightly over the course of a month, predicting mild temperatures and 1 mm of rain, i.e., average conditions for that time of year. On average, the forecast may indeed be correct, but days where the predictions were clearly wrong would quickly undermine the public’s trust simply as a result of how the predictions were presented, i.e., that no concession was made for variability. Communications research also suggests a need to weave the impacts of climate change into a broader context that includes nonclimatic factors. Lejano et al. propose that science communication needs to better incorporate the use of narrative and everyday experiences. The authors argue that public discourse regarding climate and weather cannot be isolated from other issues that impact society. This approach is not unlike that taken by the US Center for Naval Analyses , which considers climate change not as an independent threat, but rather as a threat multiplier for political and social instability in volatile regions of the world. A compatible argument was made by Hansen et al. who advocated for an approach that considers climate change as essentially “loading the dice”. Hansen et al. argue that scientists should not claim that ongoing climate change is the cause of observed impacts, per se, but rather that climate change increases the chances of the impact happening to a degree that it likely would not have occurred without changing climatic conditions. An approach along these lines has the potential to arm nonscientists with the knowledge to better understand the role that climate plays in driving weather and the subsequent ways in which weather interacts with other factors. To move forward, we need frameworks that better account for the seemingly idiosyncratic responses that result from local environmental conditions and the often overarching importance of biological processes. Such approaches may superficially appear to be at odds with the search for generalization that science often seeks. However, a focus on the mechanisms by which organisms are affected by climatic and nonclimatic factors, and how such impacts ultimately translate into ecological responses that impact humans, provides a way forward. For example, a mechanistic framework based on the relative importance of temperature and water availability in driving plant survival could potentially explain both downslope and upslope shifts in distribution; here, the generalization is based on the process, not the outcome. Thus, while it is unrealistic to experimentally evaluate the endless combinations of stressors on countless species, such an exhaustive survey in the end may not be needed. Instead, a better understanding of mechanism can point to vulnerabilities in organisms and ecosystems, for example, conditions that lead to the extirpation of keystone or habitat-forming species, or declines in ecosystem services . More importantly, this viewpoint acknowledges that at some level, responses of ecosystems are inherently variable and therefore difficult to predict with high levels of confidence. While such uncertainties can be misconstrued as an excuse not to act, the success of entities such as the insurance industry suggests that action can be prompted when stakeholders have a realistic estimate not only of the likelihood of extreme events but also the costs of inaction ,. By more deliberately uniting explorations of the ecological and socio-ecological implications of physical change and, in particular, by testing our models using metrics and indicators based on the questions to which they are applied, we can enhance communication not only among climate researchers but also with the general public. The authors are grateful to F. Choi for his assistance with Figure 1. BH was supported by grants from NASA (NNX11AP77) and NSF (OCE-0926581). We are grateful to Auroop Ganguly, Mark Patterson, George Somero and several anonymous reviewers for their helpful suggestions and insights; their careful efforts significantly improved this manuscript. GAW received support from the Hong Kong Research Grants Council (HKU78011M). This is contribution number 319 from the Northeastern University Marine Science Center and is publication number 1 of INSHORE. 40665_2014_6_MOESM1_ESM.mp4 Additional file 1: Animation showing relationship between body temperature and thermal performance over time. Many ectothermic organisms experience rapidly fluctuating body temperatures, even over the course of the day. Since acclimation cannot compensate for these rapid changes, physiological performance can also vary radically over short time periods. Average environmental conditions are thus frequently poor indicators of physiological performance. BH, BDR, and NM led the writing team, and all authors edited the manuscript. All authors contributed substantially to the ideas presented in this paper. All authors read and approved the final manuscript.